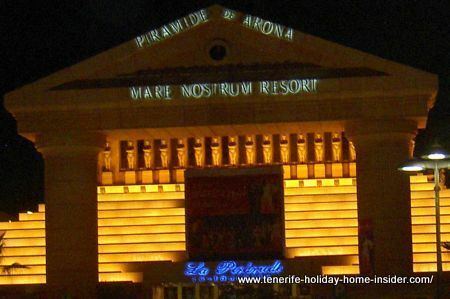 Tenerife photos Arona for yours and the kids virtual millionaire's tour. 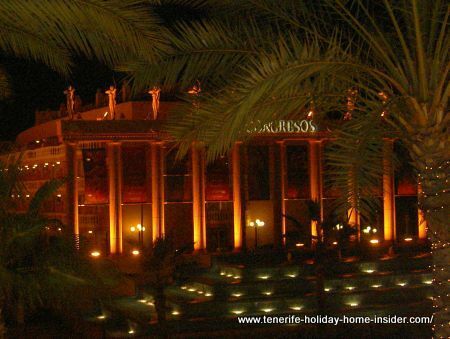 Tenerife photos Arona show you south Tenerife Las Vegas style vicinity which is free for all. Hence, no photos of them, here. Before I had a chance to capture those stunning Arona pictures, a friend said, he would show me one of best Tenerife attractions, at night, by Adeje and Las Americas. In fact, photo Mare Nostrum Piramides Arona is yet again a symbol for a luxury hotel resort complex. Money was no object, indeed, when this famous Tenerife resort was built in Hollywood millionaire's style for best resort images. Not depicted are the 3 resort hotels Julio Cesar Palace, Marco Antonio Palace and Cleopatra Palace with their splendid patios and pools behind the facades of these last 2l pictures. But, my first and second image are part of the hotel resort Mare Nostrum. That's without doubt the impressive building of the Arona congress center called Arona Congresos in Spanish. It's right beside Mare Nostrum Piramides. Again, the Grecian ladies sculptured in stone feature, prominently, by the way, day and night. Such a Grecian stone beauty is on all lower pyramid steps to the left and right, also. A guest who stayed at Gran Duque Hotel on Playa del Duque Adeje never knew about the resort Las Americas Mar Nostrum of Arona, of Modern Arona Town and its total Las Vegas style neighborhood. He didn't know, there is more than one casino in the area where he could gamble to his heart's content. Why? I haven't seen Tenerife photos about it as yet. This friend of my pal Guenther looked looked very surprised when asked by him. 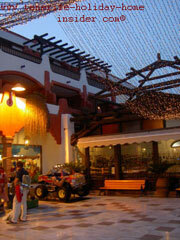 loved Tenerife attractions of Las Americas Arona. It is a musical fountain in a basin which looks like about 50 meters long. across any Tenerife photos of this monster fountain for entertainment. By the way, the Tenerife musical fountain of La Arona, which is said to be the town with most local Tenerife millionaires living there, works to perfection. The shot was taken during my last, again much too short Tenerife trip to the south. Many of the great landscapes or city scapes of Arona took my breath away, like at this particular moment. 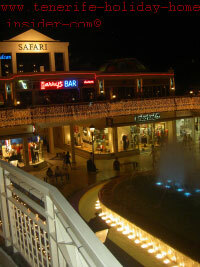 They could be scenes of nature or just the Arona fountain by the cool look-out bar of Harry's by Playa de las Americas. Harry's Bar Arona Las Americas Tenerife. 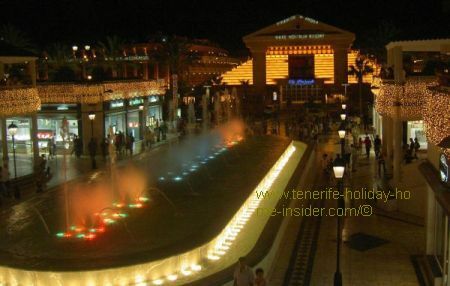 The Tenerife fountain spectacle starts by 9 p.m.
as you may guess by the Tenerife photos Arona shown. We had drinks later at Harry's Bar Arona above the musical fountain. Tables on its balcony, from where you have best opera view of the fountain show, were all taken. Harry's Bar La Arona with its speedy service and reasonable prices is popular, indeed. By the way, the balcony by Harry's bar goes all around the fountain. This veranda is ideal for taking Tenerife photos Arona of shops and passers-by below as well as of the Hollywood style buildings opposite. 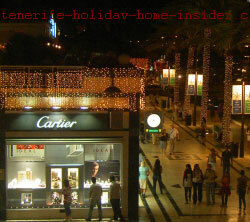 Cartier Tenerife shop for best gifts. for special gifts by the musical fountain. popular local businesses like Zara fashion very close to Mare Nostrum fountain Arona. This was indeed the shop, I had been to with the Swedish girls. Only, we weren't aware that this was Arona. We thought we were in the Las Americas main resort. This now rounds off my Tenerife photos Arona for elite shopping on holiday in Tenerife. I spoke to a young British couple, who is living in Arona. They crossed our path many times at this resort. Their little 6 year old boy wasn't bored at all by the Arona Mare Nostrum resort. Slot machine cars Arona Mare Nostrum. I will show you just now by one of my Tenerife photos Arona. Turning right when getting out by the fountain, you walk a little past mosaic lined palms. You pass a few shops and restaurants. Suddenly, there's an amusement and sports park for all ages on the same street side. 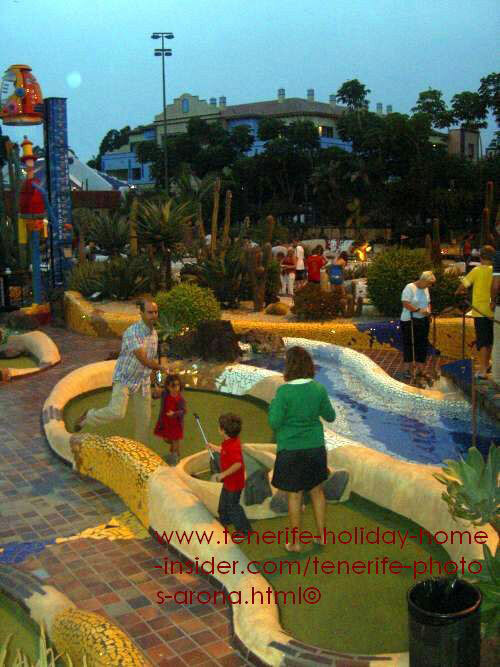 Tenerife Mini Golf at Arona of Adeje. 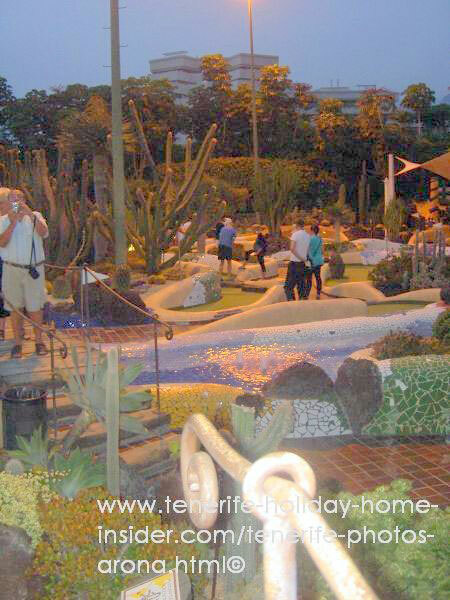 This is one of the most stunning Tenerife Mini golf places you may ever see. If I wasn't telling you you might just miss this jewel of Arona pleasures. Guenther with camera in hand, which is a shot, I got for him... Ha! I never noticed that there was this amazing golf Mare Nostrum oasis. example of Tenerife Cactus landscaping of all sorts. 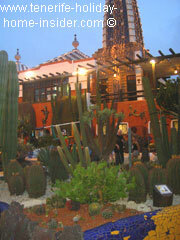 There, large Euphorbias create a dramatic back-ground in front of illuminated buildings, as the photo image shows. Feel like being in the most beautiful cactus and agave open air museum, when you admire those plants, while seeing mini golf players or, when you play Tenerife golf yourself. Mare Nostrum golf at Arona by Playa de las Americas. kids who play at Mare Nostrum golf in the image beside. 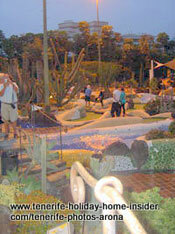 to visit this mini golf place in Arona for more than a photo safari. If you don't like to play golf walk right in, anyway... It's for free. You only pay for the golf you play. 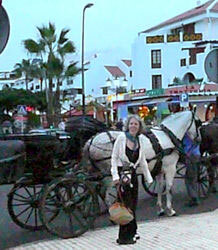 Horse carriage Arona Tenerife at dusk. From Tenerife photos Arona back to Tenerife towns.